Welcome to edition 403 of Insider Weekends. Insider buying increased significantly last week with insiders purchasing $420.25 million of stock compared to $152.83 million in the week prior. Selling also increased with insiders selling $3.05 billion of stock last week compared to $2.14 billion in the week prior. A large part of the insider buying last week was driven by 10% owner Bill Gates adding to his stake in Ecolab (ECL) to the tune of $177 million indirectly through his investment company Cascade Investments, LLC. 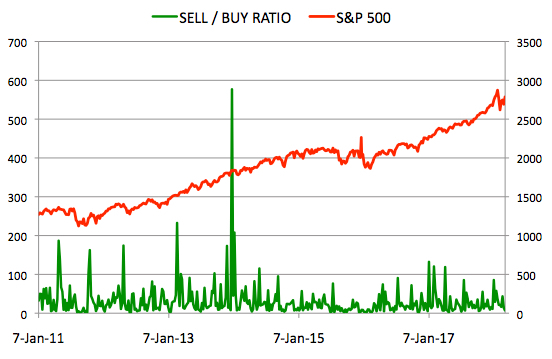 Sell/Buy Ratio: The insider Sell/Buy ratio is calculated by dividing the total insider sales in a given week by total insider purchases that week. The adjusted ratio for last week dropped to 7.25. In other words, insiders sold more than 7 times as much stock as they purchased. The Sell/Buy ratio this week compares favorably with the prior week, when the ratio stood at 14.02. Director Frederik Wilhelm Mohn acquired 2,000,000 shares of this offshore contract drilling services provider for oil and gas wells, paying $9.29 per share for a total amount of $18.58 million. These shares were purchased indirectly by Perestroika, a company solely owned by Mr. Mohn. He became one of the largest shareholders of Transocean after it acquired the Norwegian offshore drilling company Songa Offshore earlier this year. Based on my calculations, following this purchase, he owns a little over 7% of the company but the filing for this purchase indicates that he is a 10% owner in addition to being a director of the company. You can view the list of recent insider transactions for Transocean Ltd. here. Chairman, CEO & President Ernest S. Rady acquired 172,676 shares of this diversified REIT, paying $32.20 per share for a total amount of $5.56 million. These shares were purchased indirectly through a trust. You can view the list of recent insider transactions for American Assets Trust, Inc. here. CEO & Chairman Harold Hamm acquired 57,881 shares of this oil & gas company, paying $49.57 per share for a total amount of $2.87 million. Mr. Hamm increased his stake by 4.25% to 1,419,859 shares with this purchase. Chief Executive Officer John F. Barry acquired 259,386 shares of this business development company, paying $6.58 per share for a total amount of $1.71 million. Mr. Barry increased his stake by 0.76% to 34,200,271 shares with this purchase. You can view the list of recent insider transactions for Prospect Capital Corporation here. Director Sardar Biglari, acquired 3,478 shares of this holding company, paying $419.09 per share for a total amount of $1.46 million. These shares were purchased indirectly by The Lion Fund. COB and CEO Mark Zuckerberg sold 1,125,400 shares for $178.57, generating $200.96 million from the sale. These shares were sold indirectly through various entities. Chief Operating Officer Sheryl Sandberg sold 55,000 shares for $174.74, generating $9.61 million from the sale. These shares were sold indirectly through a trust. Chairman of Exec. Committee Scott D. Cook sold 159,556 shares of this accounting and tax software company for $170.26, generating $27.17 million from the sale. These shares were sold indirectly by trusts. Director Jonathan Silverstein sold 836,500 shares of this ophthalmic medical technology company for $32.02, generating $26.79 million from the sale. You can view the list of recent insider transactions for Glaukos Corporation here. SVP & Chief Operating Officer John Nicholson sold 220,144 shares for $99.27, generating $21.85 million from the sale. Director Christopher A. Kuebler sold 40,000 shares for $97.60, generating $3.9 million from the sale. These shares were sold as a result of exercising options immediately prior to the sale. You can view the list of recent insider transactions for Nektar Therapeutics here. 10% Owner John F. Fisher sold 500,000 shares for $34.43, generating $17.22 million. These shares were sold indirectly through a trust. President & CEO, GAP Jeff Kirwan sold 101,820 shares for $33.73, generating $3.43 million from the sale. 56,250 of these shares were sold as a result of exercising options immediately prior to the sale. President & CEO, Old Navy Sonia Syngal sold 28,846 shares for $33.10, generating $954,780 from the sale. VP & Chief Accounting Officer Dara Bazzano sold 4,066 shares for $34.00, generating $138,244 from the sale. 1,200 of these shares were sold as a result of exercising options immediately prior to the sale. You can view the list of recent insider transactions for The Gap, Inc. here. Disclaimer: I hold a long position in Gap (GPS). Please do your own due diligence before buying or selling any securities mentioned in this article. We do not warrant the completeness or accuracy of the content or data provided in this article.